If you hear this program for the first time don't worry you haven't missed anything as Music in the parks festival is held every year in Barcelona city, So you can attend this lovely and relaxing event this summer. This music show is for open air concert lovers. In 2014 Barcelona events are really full with many concerts and theatre shows. From all around the world many people try to attend these shows every summer in 2014. In Barcelona city, every single day is full with many activities. Any person can attend at least one event. Music in the Parks organization is held at various parks. You can have chance to watch great music concerts held by young musicians. In Music in the Parks Barcelona program there are two different shows based on Jazz and municipality band. 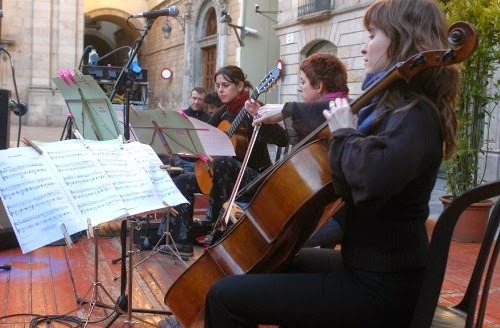 From June to August you will see young jazz musicians on Wednesdays and Fridays at 10.00 pm in Ciutadella Park and in July you can listen to performances of young musicians based on classical music concert from Thursdays to Saturdays in different parks. Every Thursdays from July to August it's likely to watch municipal band performances. Barcelona 2014 events are not only these ones. If you wonder about events in July 2014 in Barcelona city please follow Barcelona city travel guide. We hope you can find an enjoyable event that you will like. Enjoy your holiday in Barcelona city this summer. Don't miss out upcoming 2014 events in Barcelona city.